2000 Domane Mugneret-Gibourg, Vosne-Romanee, Red Burgundy, France. It’s always a joy to have a bottle of Vosne-Romanee presented to you to taste and especially such an iconic label such as Mugneret-Gilbourg, a wine that shamefully I don’t often get around to having much, but a domaine I always keep an eye out for, in particular this village wine that is a classic. While 2000 may not be a remarkable Burgundy vintage, though this bottle is drinking well, and the winery itself has only more recently, since the 2005 become one of the grand estates in the region, where it is now right up there with the fabled Domaine Romanee-Conti, Armand Rousseau and Mugnier! The Mugneret sisters show particular skill in their use of new oak, as I only taste a enough to known it’s there, of which the percentage increases from the basic Bourgogne to the ultra concentrated Grands Crus, will this Vosne seeing maybe 25% new, yet it is seamlessly integrated into the wine, as I’m sure it is will all their bottlings. Because of the strict selection at harvest, and the gentle racking of their wines fining and filtration are unnecessary, allowing as much purity of place and grapes to shine through. This 2000 takes a few minutes to wake up, but once open and flowing the medium weight palate gathers itself and delivers a fine performance with a slightly stewy note and autumn leaves element blowing off quickly to allow pretty rose petals, plum and mulberry. In the minutes that follow as your attention gets reset there is a darker/dusty cherry core that emerges and some pretty violet florals come out, along with a touch of smoke, mineral tones, black tea, baking spices and a faint leathery note. This is not a blockbuster of a wine, but a nicely aging Burgundy of a fine filament quality. 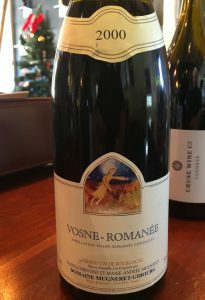 Besides this Vosne-Romanee, be sure to look for their old vine Nuits-St.-Georges, it is a sleeper in their lineup, but always keep an eye out for this one, especially in better years, it’s a rewarding prize, since they are very difficult to find. It was a pleasure to try what is considered one of the very best Vosne village wines out there, it is as mentioned a really lovely wine, though I don’t see it getting better at this stage, and it makes me want more Mugneret-Gilbourg, especially younger vintages like 2008, 2010, 2012 and 2015 that should be mind blowing!